This entry was posted in Uncategorized and tagged exocomets, Kepler on August 22, 2017 by waspplanets. The two stars, WASP-20 A and WASP-20 B seem to be gravitationally bound, and the planet appears to orbit the brighter star. The companion star is 61 astronomical units from the planet-hosting star, close enough that it might have had a gravitational effect on the orbit of the planet. This is relevant since hot Jupiters are thought to have been created much further from their star than their current close-in orbits, and gravitational perturbations from a third body is one suggested mechanism for causing them to migrate inwards. This entry was posted in Uncategorized and tagged binary stars, WASP-20 on November 30, 2016 by waspplanets. The main way of measuring the mass of an extra-solar planet is to record the motion of the host star, caused by the gravitational tug of the planet as it orbits. One can do that by measuring the Doppler shift (radial velocity or RV) of the spectrum of the host star. However, as a planet gets smaller or further from its star, the tug gets smaller, and so the radial-velocity signal decreases. At some point it gets smaller than the intrinsic variations in spectral lines caused by the magnetic activity of the star. Whether one can account for this will limit our ability to prove the existence of small planets in wide orbits. A team lead by Raphaëlle Haywood, of the University of St. Andrews, and now at Harvard, had the idea of treating our own Sun as a star, by looking at the RV signal in sunlight bounced off the asteroid Vesta. They could then compare the RV signal to images of the magnetic activity on our Sun. 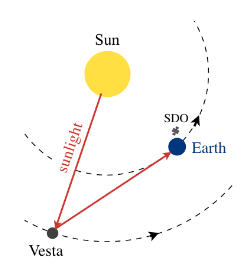 The spectral lines from each region of the Sun’s disc will depend on the local magnetic activity, but the RV measurement bounced off Vesta would be from light averaged over the whole disc of the Sun, just as we’d record from a star. The results are shown in the plot below. The top panel shows the variations in the measured RV signal, in metres per second. 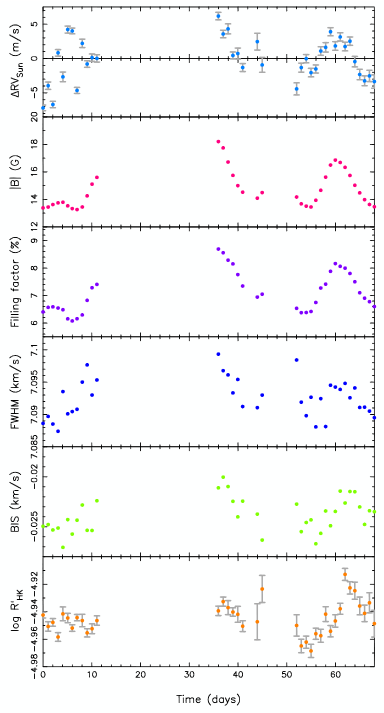 The second panel shows the magnetic flux aggregated across the Sun’s disc, in Gauss. 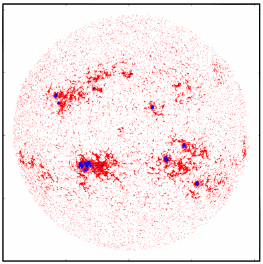 The third panel shows the fraction of the Sun’s disc filled by magnetic activity (Sun spots). 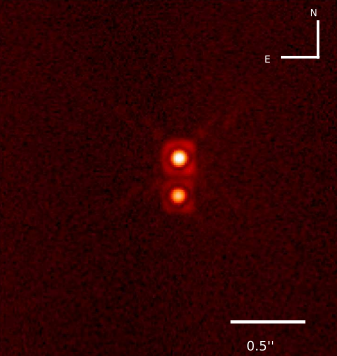 Thus a Sun-like star can show intrinsic RV variability at a level of metres per second, and this will cause a problem for detecting the small RV signals of low-mass planets in wide orbits. For example our Earth produces motion in our Sun of only 0.1 metre per second. Unless there are stars much less magnetically active than our Sun, it is going to be hard to obtain an accuracy sufficient to detect the RV signal of an Earth-like planet in an Earth-like orbit. The authors note, though, a strong correlation between the RV signal and the total magnetic activity. Thus it might be possible to decorrelate against magnetic activity to provide a way of correcting RV signals for this effect, and so dig out smaller signals caused by planets. This entry was posted in Uncategorized and tagged exoplanet discovery, exoplanets, magnetic activity, radial velocities, Sun, Vesta on January 27, 2016 by waspplanets. With over a hundred gas-giant exoplanets now known transiting relatively bright stars, thanks to WASP and other projects, scientific attention is being directed to characterising their atmospheres. 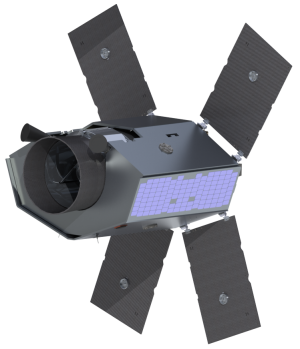 Twinkle is a new proposed satellite, led by a team from University College London, that would be dedicated to studying exoplanet atmospheres. The aim is for a relatively cheap and quick mission, but with a high scientific return. Twinkle aims to analyse the atmospheres of 100 exoplanets using an infrared spectrograph. By comparing the spectra observed in and out of transit, and spacecraft will detect signatures of molecules in the transiting planet atmospheres. The project needs £50 million to succeed. WASP planets would be prime targets for Twinkle, and so we hope that Twinkle gets funded and wish it every success. The Twinkle team invite expressions of support at the Twinkle website. This entry was posted in exoplanet atmospheres, Uncategorized and tagged Twinkle on February 9, 2015 by waspplanets.